An authentic Irish pub with spacious surroundings, the O'Donnell's pub is probably one of the best places where you can sit and watch a football match while enjoying your drink. Well, it doesn’t mean that non-alcoholics will not have a good time here. They have a beautiful arrangement on the terrace for you to relax while sipping your coffee and treat yourself to a lavish breakfast. You will find people from all age groups thronging the pub because of the wide range of drinks and food it offers. For a satisfactory burger with fries and a game of pool, the pub is an interesting place to go to. 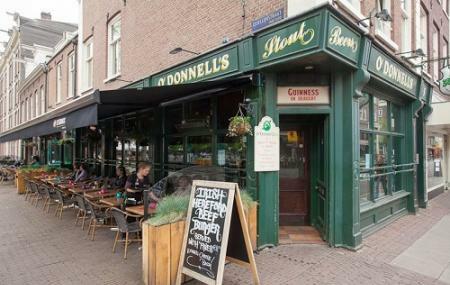 Explore O'donnell's and other prime spots of the city using Amsterdam trip planner. People normally also visit Heineken Experience while planning their trip to O'donnell's. This is not a good place to grab a bite to eat. It took forever for our server to come to us. My mom got delivered the wrong burger, and the server never came over to check on us. The food was very disappointing and clearly all frozen. It would be fun for a drink, but don’t eat here! Don't even bother going here. They don't even show all EPL game. Mad Irish pub if they don't show the games you expect them to show. They have a board that you have to check to see. If you want a sports bar, skip. In my opinion, one of the best pubs. The ambiance in the bar is excellent. I always come back to this place when I'm in Amsterdam. Decent place for drinks and standard Irish pub fare. Plenty of seating and a pool table at the back. Foodwise, the burgers are good (perhaps a bit too small) and the chips are fresh. The Shepherd's pie, however, could use some work. It seemed to have been microwaved and the taste was garlic-galore. The presentation was so bland it looked like it had come from McDonalds. (Broiling the cheese and adding some fresh garnish could make all the difference.) For the price, I expected a lot more. Doubt I'll return or recommend this place to anyone. Cozy little pub located in Amsterdam. They have a nice range of bar snacks and prices are very reasonable.